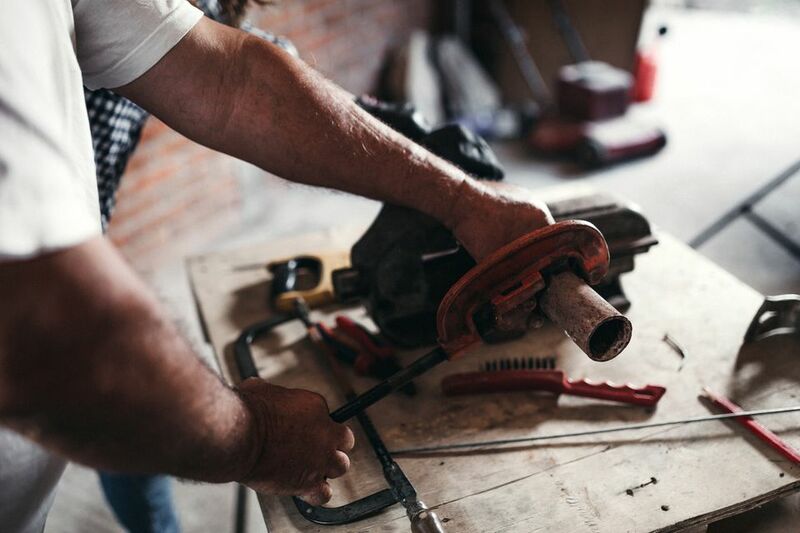 DIY plumbing projects can be made much easier by using the correct pipe cutter. Just as there are many different types of pipes, there are also several types of specialized pipe cutters available, as well as general purpose cutting tools that can be used to cut plumbing pipes along with other types of materials. Knowing a little about the types of cutters on the market can help you select the right one for your project. You will have several dedicated cutters to choose from, designed to cut specific materials, as well as some general-purpose cutting tools that can be adapted to cut plumbing pipes. Copper tubing cutters are specialized pipe-cutting tools taht come in many shapes and sizes, from small thumb cutters to quite large tools designed for big pipes. All types work in essentially the same way: the tool grips a pipe between rollers and a sharp cutting wheel, and as the tool rotates around the pipe, it scores a gradually deepening cut into the walls of the pipe. Using a copper tubing cutter on materials other than copper tends to dull the cutting blade, so if you do this regularly, expect to change the cutting wheel occasionally. Small "thumb-type" cutter that is ideal for getting into tight locations. This type can normally cut pipe up to 1 inch in diameter, but it requires a bit more effort. Standard copper tubing cutters have a larger body and handle that makes it easier to rotate the tool around the pipe. Many standard cutters have reaming tools built into them, designed to smooth the cut edges of the pipe before soldering or fitting. Auto cutters are also available. These also work well in tight quarter. They tighten down automatically with each rotation of the cutter around the pipe—there is no manual tightening necessary. Make sure to buy a copper tubing cutter that is appropriate for the size of pipe you normally work with. PVC ratchet cutters are amazing tools for working with PVC pipe. Operating something like a pair of ratcheting shrub pruners, each time you squeeze your hand, the cutter ratchets closed, cutting a small amount of pipe material until you have cut all the way through the pipe. PVC cutters are made to cut various sized pipes up to 2 inches in diameter. The most common sizes will handle pipe up to 1 1/4 inches and are priced starting at about $10, so they are very affordable. If you have decent hand strength, you can easily ratchet the cutter until it cuts right through PVC pipe. These cutters are also great for cutting CPVC and PEX. PVC tubing cutters are not recommended for ABS pipe, which is too brittle to be effectively cut by a PVC tubing cutter. ABS is normally cut by a hacksaw or other type of general-purpose saw, such as a power miter saw. Most people cut ABS pipe with some kind of a coarse saw. There are specific saws for cutting ABS, but you can really use any type of saw, even a hacksaw. A coarse saw is also good for cutting PVC. On both ABS and PVC pipe, you will need to clean off the inside and outside of the pipe after cutting, because using a saw does leave large burrs on the plastic pipe material that can interfere with solvent gluing. Specialized pipe cutters are available for cutting iron or steel pipe, which is very hard to cut any other way. Iron pipe cutters make a nice straight cut every time. They work exactly like the larger copper cutters but have a thicker and stronger cutting wheel to handle the thicker, harder walls of the steel or iron pipe. Turn the handle to clamp down tighter every turn or two until the pipe cutter severs the pipe. This type of cutter does require a lot of room to turn, so in tight spaces, you may have to use a reciprocating saw equipped with a metal-cutting blade. These large chain-type cutters will cut cast iron, clay, and concrete pipes. There are both ratchet and scissor versions of this tool. Snap cutters operate with a chain fitted with a row of sharp cutting discs. Once the tool's chain is wrapped around the pipe and tightened, it eventually snaps the pipe as cleanly as if it had been cut by a saw. A snap cutter requires some practice to learn how to set the chain, and it is very heavy to maneuver. It is also a very expensive tool that few homeowners want to own. Where necessary, it's best to lease this tool from a home center or tool rental center. To be safe, it helps to practice a few times on spare pipe before cutting a pipe in a tight space. A soft tubing cutter is a scissors-like tool that operates in much the same way as a PVC tubing cutter, but rather than a ratcheting action, the tool simply cuts through soft tubing with a single squeeze of the handle. Just wiggle the blade back and forth to get it started in the pipe, then squeeze the handle to cut all the way through. his type of cutter works great, but extended use may tire your hands. PVC ratchet cutters also work great for cutting this type of pipe, as do most ​​saws, so feel free to use whatever you have in your plumbing tool box. If you do plumbing repairs infrequently, or if you have a unique situation where the specialty cutters you own don't quite fit the bill, any number of general-purpose saws can work to cut plumbing pipes. Hacksaw: Use for virtually any type of plumbing pipe. Jigsaw: Fitted with the right blade, a jigsaw can cut nearly any plumbing pipe up to about 1 1/2 inches in diameter. A wood-cutting blade easily cuts plastic pipe; use metal-cutting blades (and a slow saw speed) when cutting copper or other metals. Reciprocating saw: Even more versatile than a jig saw, since it can be used for larger diameter pipes. Use wood-cutting blades for plastic pipe, metal-cutting blades for metal pipes. Power miter saw: This tool can be useful for cutting perfectly square ends when working with plastic pipe of any kind. General purpose woodcutting blades work fine for plastic, but expect to dull the blade rather quickly. For metal, there are special metal-cutting blades you can use with your power miter saw. Do not try to cut metal with wood-cutting blades. Crosscut hand saw: An ordinary carpenter's saw can work fine for cutting rigid plastic pipe, but should not be used with metal.